Just a small post about my old 2011 Samsung tv. Today it did not start and was rebooting in a loop. 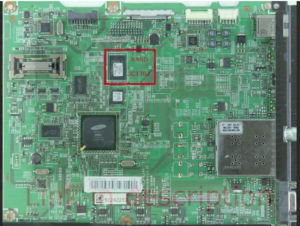 After some googling i found a YouTube post how to reset the Eeprom. Unfortunately it did not work (i think) so i did read some more post about problems with a bootloop. Some person suggested to place the main board into the freezer for 2 hours. After cooling the NAND chip for 30 second i waited a few minutes so the liquid was vaporized. I have to admit that a was surprised that this step did solve the bootloop. The tv was starting normal and i needed to reinstall the settings, but its working again. This was a situation where i needed to test a new raspberry image on my raspberry pi-A, and i could not find my usb hub. So i needed to do a offline wifi configuration to boot the device with a wifi dongle, and configure the device from ssh. Now insert the edit memory card to the raspisystem, and boot. If you have a dhcp server on your system, your device will be connected to your network, and you can continue to connect to your raspberry with putty. p.s. you can use fing (on your mobile phone)to find the ip address of the raspberry, if you can’t read your dhcp leases. If this info is usefull, just give me a hello. This was a situation where i had a small problem, and after some changes it got bigger and bigger. The original problem i had was a non working hibernation system on a Windows7 computer. The reason was simple. I did have a small boot partition and the system was a factory default fujitsu. I did not like the idea of the small boot partition because i also wanted to use a other BCD loader, so i first made a image of the bootpartiton, and then a remove the boot partition. After this i got a stop C000021a error, and i was expecting a easy fix with a Windows7 bootrepair cd. If you don’t know where you can find the option of creating a System Repair Disc, just use google to find out, its just a option on any Windows7 computer. Then hit on delete, so you completely remove the complete key and subkeys. Then make a reboot and if you’re lucky your problem is fixed. If you’re not lucky then the keys are regenerated with the wrong values, but is easy to fix. Take a look at the values on the ramdrive HKLM\SYSTEM\MountedDevices and you will understand the problem and know what to change. I hope this info will be helpful for some other people. I made a Midi from the song Indaco, so i could practice this song with synthesia. I made a Midi from the song Samba, so i could practice this song with synthesia. I made a Midi from the song Una Mattina, so i could practice this song with synthesia. I made a Midi from the song Fly, so i could practice this song with synthesia. If you are wondering if its possible so install esxi5 on a 5big (office) ,the answer is yes. After some trail and error i was sure i needed to reset the netwerksetting, but there is no vga output so you need to do this blind. I simulated the network reset on a other esxi system and i wrote down all the keyboard sequences. Because this system has only 2 Gb memory and not expandable, its not a very useful environment for a Esxi server. I will post some printscreens of the running esxi environment as soon i have the esxi bootdisc found. My old server was using 120 Watt power, This one only use 40Watt. For WHS 2011 backup, you need to install framework 4, and it will not even backup a 2003 file server. This problem was driving me nuts. I did read at least 50 articles on how to debug firewall problems. I did all the stuff like “sfc scannow”, the microsoft fixit, tech articles, service repair programs, and still a nonworking firewall. Just when i was giving up, and made a prepare for a full system reinstall, I got it fixed. The Windows Firewall service is starting. The Windows Firewall service could not be started. A service specific error occurred: 13. If you don’t have a error 13, just skip the complete article. This article is only for people with a error 13. Also its a last resort. Don’t blame me, if your computer is not working after my suggestion’s. Click on “Allow a program through Windows Firewall”. Click on Advanced Tab->Restore Defaults.